The latest member of the VW I.D. Concept family is inspired by classic Beetle dune buggies from the 1960s. At the 2017 Detroit Auto Show, Volkswagen presented the electric I.D. Buzz Concept previewing a future production model that will revive the iconic Microbus. Now, Volkswagen is introducing a new member of the I.D. Concept family that revives another icon. Debuting at the 2019 Geneva Motor Show this week is the Volkswagen I.D. Buggy inspired by classic Volkswagen Beetle-based dune buggies from the 1960s. It’s designed to showcase the versatility of VW’s MEB platform, which will underpin other I.D. models. The MEB chassis integrates a floor-mounted 62kWh lithium-ion battery and an electric motor integrated to the rear axle that produces 201 hp and 228 lb-ft of torque while delivering an estimated range of 155 miles on the WLTP cycle. On paved slopes at full acceleration, the concept car sprints from 0-62 mph in 7.2 seconds and hits an electronically limited top speed of 99 mph. With no doors or roof, the two-seater concept has an extremely minimalistic design measuring 160 inches long, 74.4 inches wide and 57.6 inches high with short front and rear overhangs (27.0 and 28.6 in respectively). The wheelbase is 104.3 inches and ground clearance is 9.4 inches. Elsewhere, the prominently raised hood, fenders and tail end hint at the concept’s off-road capability. As a modern take on the classic dune buggy, the concept also features LED headlights and taillights, an LED VW logo, and a body that appears to float above the chassis. This floating effect is created by the Buggy's two-tone exterior. The top half of the car is painted in matte Fern Green, while the bottom is painted in a textured Grey Tech Blue. To make the I.D. Buggy capable off-road, standard 18-inch wheels are wrapped in BFGoodrich All-Terrain T/A tires. A solid aluminum underbody guard ensures that the front axle and ancillaries are not damaged during off-road driving, and the aluminum side sill panel assumes the function of an additional underbody guard. Two robust red steel eyelets are integrated in the bumpers for towing other vehicles or rescuing the I.D. Buggy, should it get stuck. The reinforced windshield frame and the Targa bar provides rollover support. While the I.D. Buggy concept car is a pure two-seater, Volkswagen says it can also be converted to a 2+2. An additional electric motor could also be added to the front axle to make it four-wheel drive. The modular design allows for the composite upper body to be detached from the MEB chassis, allowing third-party manufacturers to modify it just as the original Meyers Manx kit did for the original buggy. The concept’s minimalist design continues inside, with a hexagonal steering wheel covered with water-proof Nappa leather featuring touch controls in the crossbar, and a digital instrument cluster. All elements surrounding the exterior are painted in Fern Green, while most of the interior trim is finished in a robust Grey Tech Blue soft-touch paint. Despite the shortened wheelbase, the interior is surprisingly spacious thanks to the compact electric drive and axles arranged further to the outside. 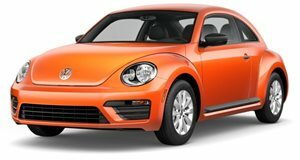 VW hasn't confirmed if the I.D. Buggy will enter production, but we’re keeping our fingers crossed because the Buggy is easily VW’s coolest I.D. concept yet.